It was a gorgeous Sunday morning in Small-town, USA. The sun was shining, the birds were chirping, the dogs were barking (no escaping the barking-- there was an almost sickening dog population, with each person having on average 1.5 dogs, but I digress). We had gotten our beautiful rescue, an English Pointer named Luke, about 6 months earlier. Not a pit bull, but I figured I needed at least some pet experience before I dove in. And when I say "our" pointer, I mean "my" pointer. Luke and V had a tumultuous relationship, to say the least. Luke and I were inseparable. I was completely transformed into a "dog person" at that point. I took him on hikes (by hike I mean a walk around the neighborhood trail, which was more than I was used to anyway), I took him shopping so he could choose his favorite toys, and I took him for grooming every 2 weeks. Seeing Luke grow from a terrified and shy creature to a proud pointer in all his glory made me appreciate just how much human love can transform a dog. I had just come back from taking Luke on his morning walk, and I decided to go for a drive. I turned out onto the main road leading out of our apartment complex, and I saw this black shadow hobbling along the side of the road. No collar, no owner in sight. I slowed down and pulled up next to the dog. 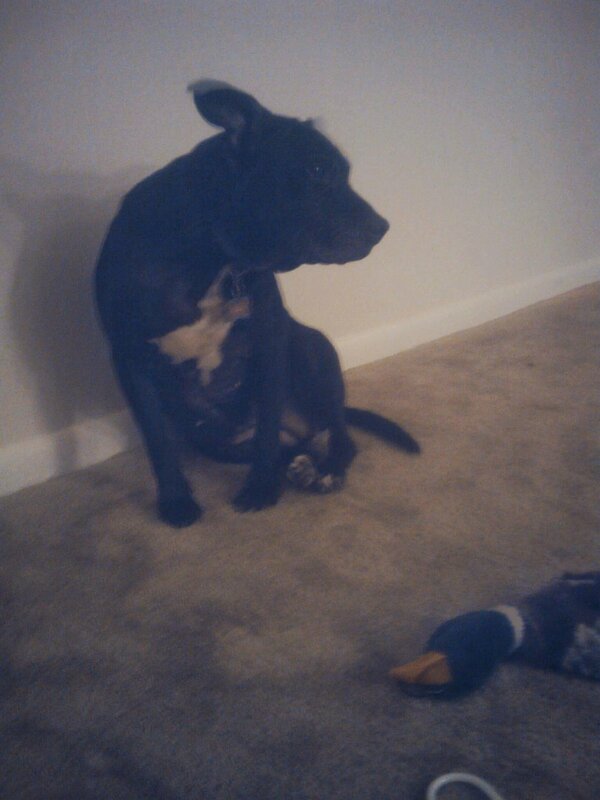 Black, female, pit bull. I remained cautious at this point because she was a stray, after all. Wait a minute. Strays don't exist here. Every dog belongs to somebody. I rolled down the window. "Hey Girl!" I called out to her. I was still in the car, but I was close enough to get a good look at her. She could barely walk. She seemed tired, thirsty, and she had a terrible limp. "Hey girl, come here girl!" She started to hobble towards me, as if she could understand the basic command. Excellent! We established communication and she was walking towards me. Wait a minute. A strange pit bull is walking towards me. I have no idea what I'm doing. I turned the car around and parked on the side of the road. V would know what to do. My heart ached. What if that was Luke? I got out of the car and, maintaining a safe distance, called her to follow me. She made it to our apartment. I banged on the door for V to come outside. He came out through the front door. "What the hell is this?" He asked, motioning towards the dog. "I found her up the street," I explained, "No collar but I don't think she's a stray. And she stinks". V leaned in closer, "Yeah, she does. Skunk". "We can't. They're closed on Sunday. We have to wait until tomorrow. But what do we do now?" "Well she needs food and water. I'll put Luke away in the bedroom then I'll get her something to eat and drink. You go to the pet store and get some skunk shampoo." He put Luke away then led her inside. He kept talking to her and that seemed to make her a bit more comfortable, though she still seemed terrified. I went to the store and rushed back with the shampoo. When I walked through the door, she and Luke were already sniffing each other, and each seemed to be enjoying the other's company. V gave her a bath and used about half of the bottle of shampoo. We had an extra collar and leash, and we took them outside a few times more that day. She was clearly housebroken. What could have happened to her? The next morning, I called animal control. I described her and they checked their records for reported missing dogs. I started to get nervous. What if there was no record? What do we do? Do we surrender her to the pound? No, we can't do that. We'll keep her. We have to. "Ma'am," the rescue agent continued, "we have a black pit bull, reported missing Friday. Says here that she escaped after the owners were trying to give her a bath after she got sprayed by a skunk." "Well I guess it doesn't get any more specific than that." I gave them my contact info so that the owner could contact me. She sent me a text a few minutes later, asking if I could meet her at a nearby gas station. V and I loaded her up with her one posession: half a bottle of skunk shampoo. We pulled in to the gas station and there was a woman with 4 children. Their eyes lit up as we approached. "Santana! Santana!" The kids all ran towards her and started showering her with kisses. It was obvious that they didn't think that they would be reunited with their dog. I explained everything that happened and how I came to meet the gentle thing. Her owner thanked us and told us she didn't think that Santana would make it, since she was in poor health. She was an older dog, and wandering around really took a toll on her. I looked at the love she was met with and I knew she would be okay. V and I drove back to our apartment. We walked in and Luke searched behind us, looking for his new friend. "I'm sorry, Luke," I explained, "She had to go back to her real home." We sat there with Luke for a while, in silence. "I know it sounds weird, but I miss her," I confessed to V. "I know, me too," he replied. "So when are we getting our own pit bull?"